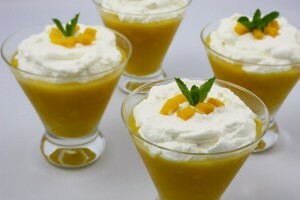 Quick Mango Delight recipe by Aisha Mazharnone at PakiRecipes.com. First we will peel the mangoes and will cut it into small pieces similarly we will do it with peeches. Then we will boil the milk and will add the sugar and mix it properly then we will add the fruits and serve it chilled.